You may recall in the post on the pelvis that we began to view the pelvis in terms of having two pelvic halves with the spine in between. In that view, the two pelvic halves meet at the pubic disc in the front of the pelvis, a location of movement. And the two pelvic halves meet the spine at the SI (sacroiliac) joints in the back of the body. 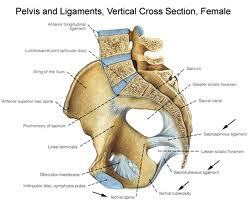 Place the palm of your hand at the back center of your pelvis; this is your sacrum. On each side of the sacrum you may notice two little dimples. This is where your SI joints are. There is some possibility for movement here, but too much movement will strain your SI ligaments. Judith Lasatar o ften teaches about the sacrum and SI health. In one of her recent Facebook posts, she announced that the sacrum is tilted anteriorly at a 30-degree angle in tadasana (mountain pose). This sets up your natural lumbar curve. Come into standing, feet underneath your hip sockets, and allow your sacrum to have its 30-degree tilt. Let yourself have your natural lumbar curve. In other words, don’t flatten your low back by tucking you tail. Instead, imagine a fishing line with a weight tethering straight down from the tip of your tailbone (coccyx). Without changing your tilt, add a little engagement of your abdominal muscles and pelvic floor. This is a supported tadasana. Movement of the sacrum is called nutation and counternutation. 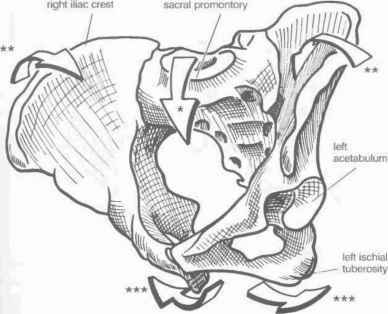 In nutation (illustrated below), the top of the sacrum moves forward into the body. In response, the top of the illia narrow, the sitting bones widen, the tailbone lifts away from the pubis, and the lumbar curve generally deepens unless the whole spine leans forward to follow the tilting sacrum. Many of you have learned this as a dog tilt or have felt it in old cow pose. The opposite is counternutation or cat tilt. With a few exceptions, most yoga poses are done in neutral or in nutation. Some exceptions include cat pose, rabbit, and crow – poses that require a deep, supported flexion of the lumbar spine. Ironically, in yoga, backward bends and most forward bends use the nutated position. To explore this come into dandasana, staff pose, sitting with the legs out in front. The first thing to note is whether your sacrum is vertical. If you find that it is tilted backwards and it is difficult to sit tall, you will sit on props – blankets, bolsters, chairs, whatever it takes to sit with a vertical sacrum. If your hamstrings are tight, this is as far as your pelvis will be able to roll forward over the legs. If they are not so tight, let the pelvis roll over the legs. Then bring your hand to your sacrum and allow a tiny tilt forward of the top of your sacrum into the body. This is your nutation. Let your whole spine tilt forward as well, following the sacrum. From there, if you choose, you can consciously arc the spine into forward flexion from above the sacrum. For backward bends, come onto your belly with your hands under your shoulders and your elbows reaching straight back. You always want abdominal support for backbending, but that doesn’t mean the same thing as tucking your tail. Instead actively reach your tailbone toward your feet and engage the pelvic floor and abdominals with a slight lift. From there, let your elbows reach back as your chest floats and your head reaches forward and arcs upward into a baby cobra. You probably didn’t even feel it, but your sacrum nutated to allow you to lift your head. Try it a couple more times and see if you can feel that slight nod of the top of the sacrum into your body. Another place to play with nutation and counternutation is in bridge. When we ask our students to tuck the tail and roll up, or down, bone by bone to articulate through the spine, this is counternutation. Try it a couple of times. Now, let’s try it a different way. Keep the back of your sacrum horizontal, don’t tuck. Press into your feet and let your pelvis just hover off of the ground. Notice the feeling of the illia sliding behind the sacrum slightly as the sacrum lifts up into the body. This is my favorite version to set up big backbends and inversions. But try it and see what works best for you. One place of SI strain in yoga is in twists and asymmetrical poses. For asymmetrical poses, review the post on the pelvis and the one on foot to pelvis. But let’s talk about twists now. If you are isolating the twist to the thoracic and cervical spine, work to stabilize you pelvis. But know that your range will be limited. If you are doing a bigger twist, you will want to wrap the abdominals and take the twist through the whole spine. Because there is limited rotation in the lumbar spine, what often happens is that the sacrum rotates when we do this. If we keep the pelvic bones square and stable, our sacrum will turn, but our ilia won’t. This sets up a scenario of strain for the SI joints. Instead, let the pelvic floor be involved in starting the twist and let the pelvic bones rotate a little bit. So that if you are twisting to the left, the right sitting bone shifts forward a bit. 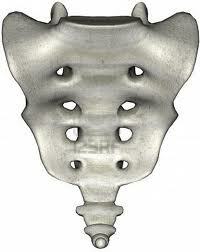 This allows the ilia and the sacrum to stay on the same plane with little strain in the SI joints. As always, try these ideas on in your own body and let us know what you experience.